Grateful Dead Records was a partnership of ten people; the current band members plus Ron Rakow, Jon McIntire, Rock Scully and Alan Trist. At the end of 1975 the group abandoned some of their independence and signed a distribution deal with United Artists. After this time albums were released with both Grateful Dead Records catalog numbers and United Artists numbers. 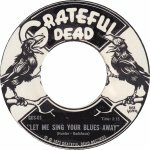 The Dead however retained rights to their recordings of this period and they subsequently became available through Grateful Dead Merchandising. The labels were wound up in 1976 and the Dead signed with Arista. The first Grateful Dead LP on Grateful Dead Records was released in October 1973. It was the groups first studio album in almost 3 years. Wake Of The Flood features a horn section on some tracks. An expanded version of the album was released in the Beyond Description box set in 2004 and as a single CD in 2006. The second Grateful Dead Records LP was released in June 1974. The lettering on the front cover, upside down and mirrored, reads Ugly Rumours. An expanded version of the album, with mainly additional live music, was released in the Beyond Description box set in 2004 and as a single CD in 2006. The third Grateful Dead Records LP was released in Sept 1975 and was the last studio album on the label. Garcia later said about the recording of the album: "I think that's the first record we've made in years where we really had fun. ... We laughed a lot and got good and crazy. We had an opportunity to get weirder than we normally get to getting." An expanded version of the album, with additional studio material, was released in the Beyond Description box set in 2004 and as a single CD in 2006. The last Grateful Dead Records LP was released in June 1976. Steal Your Face is a double LP of live music recorded at the Winterland shows in October 1974. This album was not included in the Beyond Description box set. A double LP repackaging of the first two Grateful Dead Records LPs. This was released in Europe probably in 1977. A single LP sampler of tracks from the Grateful Dead Records and Round Record albums. A UK only release that was distributed with the Steal Your Face double LP. 12 CD box set that includes expanded remastered reissues of the first three Grateful Dead Records albums: Wake Of The Flood; From The Mars Hotel and Blues For Allah. The set also includes expanded versions of the Grateful Dead albums released on Arista. The set is accompanied by two 90+ page booklets "The Band" and "The Albums".